This is a thread where you can post some pics of your rig. Last edited by Ciro; 12-01-2007 at 19:53. It looks better now I managed all the cabling. Plus the nobudget build has encouraged me to install the smallest P4 heat sink i could find, on to the northbridge . I got rid of the HD bay last night to install a n AC 110v 250cfm fan. 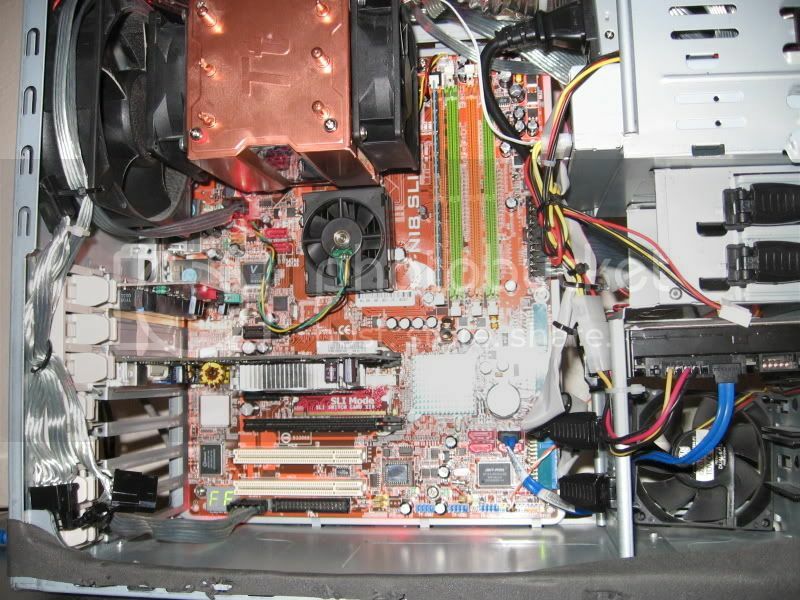 Last edited by clangerdoa; 28-08-2006 at 23:23.
is it just me...or are those ram slots placed kinda far apart? and hows those "flex force" cables treating ya? As for the ram slots During that shot i had Kingston Value ram that was causeing me a lot of trouble. (mem dumps) So i just tried runnnig one stick and it still sucked so i went and bought some hyperx, It works well now. Also the dumps were happening as i was using a ATI tv tuner card to do some VHS to DVD. I had to take out my other vid card cause the tuner card would not fit in to the bottom PCI slot..... the coax metal box kept hitting that brillantly placed molex :mad: and not seating correctly. As for those cables Flex force my a$$. They are allright but still a modular PSU still would be better. But im changing cases hopefully soon and plan to do a better job, also going to water. 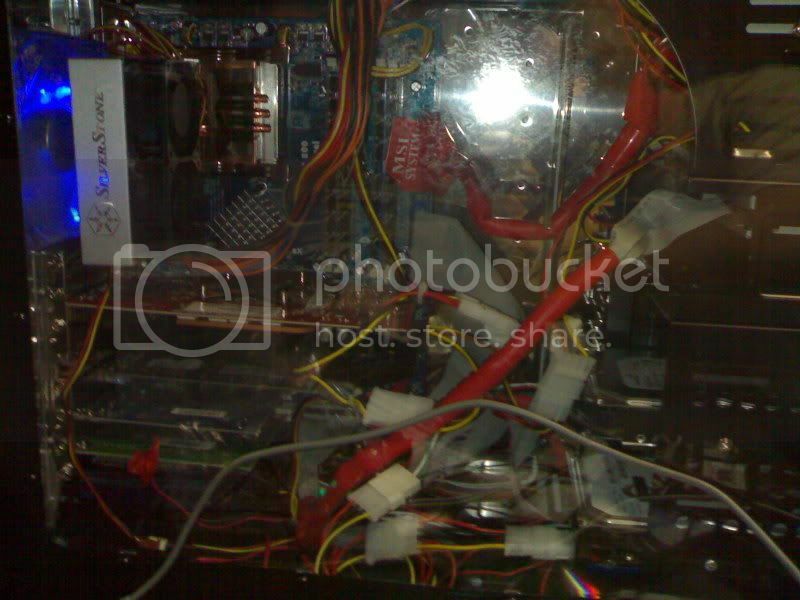 what is that molex on the bottom for anyway? I think is for the SLi, but Im not really sure i just know that the board doesnt run very well without it. The molex comes on the board originally... as said.. it supplies more power if you are running SLI.. but wouldn't be needed for single card operation. hmmm my case.. think its on these forums.. but i'll post some here. was waiting for pics of carbine's monster rig! Both under the title: Pure Inovation.. though i'm changing its name to H3O.... you can understand why. I THINK ...I just wet myself...How much did that monster cost you? 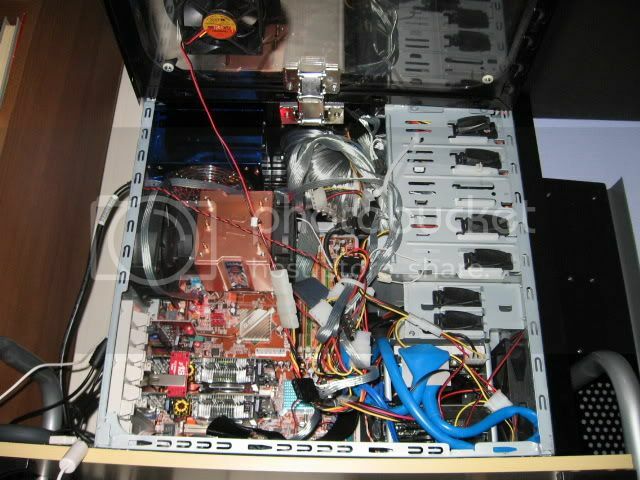 Um i built this rig from scratch so altogether i probably spent.. around 3000.
messiest most overcrowded case ? Last edited by reliant850; 04-09-2006 at 19:23.